I didn’t have local knitting friends until a little over a year ago. I had tried to find some at shops and meet-ups but just hadn’t really clicked with people or the meet-ups didn’t fit my schedule. It wasn’t until the Sugar Land Yarn Company opened up that I met some folks at their Cajun Knit Night on Friday nights. Jenn and Heloise do it up right on those nights, feeding us good food and allowing us to sit and knit or crochet and of course shop. It was there that I met some friends that I really connected with, that I can talk to about crafting and about life in general. These awesome friends made Carson a blanket! 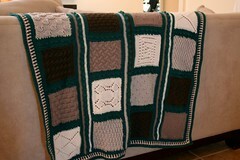 All of the squares were knit and then they were joined with crochet. 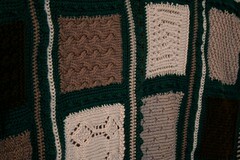 The border is also crochet. You can kind of see the little crochet bobbles that were worked in at a closer look. It is the perfect size for putting him on or for covering him up in his carseat and I just love how each one is different. The yarn is really soft, too! I am so grateful to have some local knitting friends and for C2 to have an awesome blanket that we will use a lot! Tags: C2, friends, knitting, life. Bookmark the permalink. We love you too! I’m also thankful to have such great knitting friends!